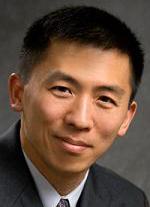 Justice Goodwin Liu is an Associate Justice of the California Supreme Court. He was confirmed to office by a unanimous vote of the California Commission on Judicial Appointments on August 31, 2011, following his appointment by Governor Edmund G. Brown, Jr. on July 26, 2011. The Governor administered the oath of office to Justice Liu in a public ceremony in Sacramento, California on September 1, 2011. Before joining the court, Justice Liu was Professor of Law and former Associate Dean at the UC Berkeley School of Law (Boalt Hall). Justice Liu graduated from Yale Law School in 1998, becoming the first in his family to earn a law degree. He clerked for Judge David Tatel on the U.S. Court of Appeals for the D.C. Circuit and then worked as Special Assistant to the Deputy Secretary of the U.S. Department of Education, where he developed and coordinated K-12 education policy. He went on to clerk at the U.S. Supreme Court for Justice Ruth Bader Ginsburg during the October 2000 Term. In 2001, he joined the appellate litigation practice of O’Melveny & Myers in Washington, D.C.
Justice Liu is a prolific and influential scholar on constitutional law and education policy. His 2006 article, “Education, Equality, and National Citizenship,” won the Steven S. Goldberg Award for Distinguished Scholarship in Education Law, conferred by the Education Law Association. Justice Liu is also a popular and acclaimed teacher. In 2009, he received UC Berkeley’s Distinguished Teaching Award, the university’s most prestigious honor for individual excellence in teaching. The Boalt Hall Class of 2009 selected him as the faculty commencement speaker. Justice Liu serves on the California Access to Justice Commission, the governing board of the American Law Institute, the Committee on Science, Technology, and Law of the National Academy of Sciences, and the James Irvine Foundation. He has previously served on the Board of Trustees of Stanford University and the Board of Directors of the Alliance for Excellent Education, the American Constitution Society, the National Women’s Law Center, and the Public Welfare Foundation.